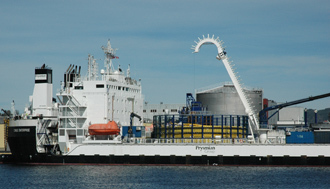 Milan, 6 May, 2015 – Prysmian Group, world leader in the energy and telecom cable systems industry, announces today the official sail out of the newly upgraded vessel “Cable Enterprise” from a moored cable laying barge into a DP2 cable laying barge able to manoeuvre with her own propulsion system at the site of work. Following major conversion works, the vessel can now operate autonomously without the need of tugs during cable installation activities. With almost 8 MW of power, Cable Enterprise is capable of maintaining her position in DP mode, even in harsher weather conditions. Her powerful propulsion system enables the vessel to undertake lay and burial operations with any type of plough, including HD3 ploughs. Importantly, the vessel maintains her ability to ground out and to operate in very shallow waters. Cable Enterprise has been equipped with 7 independent positioning systems allowing her to meet stringent operational requirements, including those demanded by the Oil & Gas industry. She is now amongst the most powerful submarine cable laying barges in the market and has unmatched green credentials, achieving an almost 80% NoX emission reduction, as the most environmentally friendly vessel of its type worldwide. Upgrade works also included the addition of new accommodation decks and operational areas, as well as the installation of a new cable tank to increase her versatility for future cable projects. The conversion works were contracted to Viktor Lenac shipyard in April 2014. 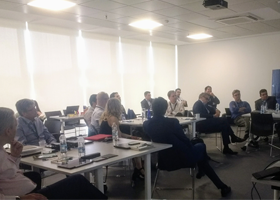 "Our objective is to further boost the Group’s submarine project execution capabilities with a powerful and flexible asset that can install the entire range of submarine cables, from interconnectors and export cables to inter-array cables between turbines or offshore oil platform grid connections", explains Raul Gil, COO of Prysmian Powerlink. “With this newly upgraded vessel Prysmian is now fully equipped to meet this target”, he added. The first project to be executed by Cable Enterprise in DP mode will be the supply and installation of submarine cables for a section of ExxonMobil’s existing offshore operations in the United States.